I found myself driving to Key West over the weekend to rescue 5 computers and get someone "back on the air". The problem with Key West is that it is at the end of a 106 mile cattle chute known as the Overseas Highway, also known as US1. The drive goes through many islands, over bridges, and the road itself is beginning to deteriorate. This being one of the most beautiful parts of the country, you don't notice how annoying it can be to drive there until around half way through. This was where I hit this particular bridge. The nice thing about it was that I could hop out and stretch my legs. I had plenty of time, it took around 10 minutes. I found myself also on the other side of a discussion. Here we're trying to turn Wilton Drive into a place to drive to not through. I was trying to drive through the Keys to get to Key West. Since the undersea tunnel shortcut was still under construction, I had to share this road with people trying to go about their own daily business. When the main road through your town is two lanes, and you have only a short way to go, you end up not driving quickly. For me, the guy in the pickup ahead of me, the Sysco truck heading to a delivery in Big Pine or Marathon, that short hop local gets wearing. Especially after 3 hours of driving, and two to go. Seems that the rule of the road in the Keys is always drive 5 to 10 mph slower than you really want to. You do this because Mom is trying to pull out into traffic without getting caught on the rust covered manatee mailbox or stuck in a line of cars without a turn around. Like in this picture. 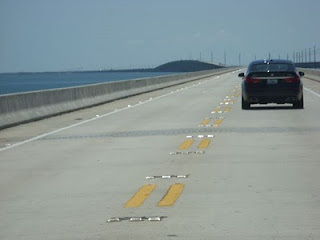 This is the Seven Mile Bridge. While it is a passing zone, you really don't want to do so because if you make a mistake, you could end up over the edge seeing what the Florida Straits look like close up. Mom was stuck in front of that BMW and she was driving 45 in a 55 zone. I can imagine that all the way to Marathon on that bridge she was "oh my"ing and "Gees! "ing about how she got caught. Bottom line is that if you're planning on driving a long distance, have plenty of music on the radio, and expect to be there an hour later than you would normally. The road was under construction on half of the islands, and the other half it should have been. Between the washboarding and the need for four lanes, Florida has a lot of work to do just to make that road safe. 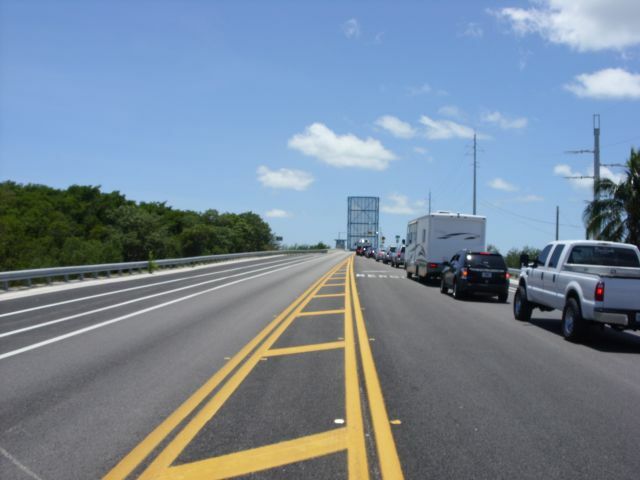 No matter that Key West is a destination and there are only 30,000 or so people at the end of that particular road, it needs to be four lanes all the way. The state is widening it in specific spots, but they've got a long way to go.